I was sitting in my office the other day reflecting on changes that I have seen in my job over the last couple of years. A really strong and effective manager left our institution a couple of years ago. During her tenure she made a series of effective changes to our culture and institution, changes that in my opinion made our organization more professional and forward thinking. Unfortunately, the culture of our institution is such that we seem to pray at the altar of the status quo, as such, any change is perceived as negative. In the last two years I’ve watched our institution effectively erase all of the changes that had been made. 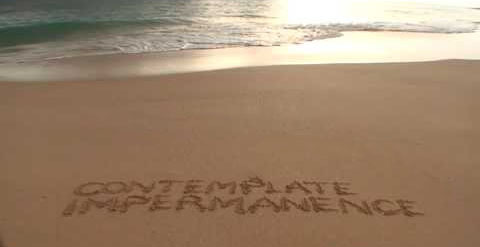 Thinking about this made me think about impermanence. You see I have personally labored under the impression that if you do good work, make positive change, that you can in fact make permanent change. To a degree this is true, but the fact of the matter is that eventually even the best accomplishments will someday be outdone, or even gotten rid of by someone else. 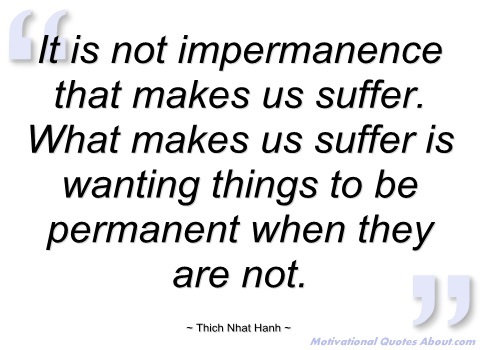 This entry was posted in personal happiness and tagged be happy, blog, happiness, happy, impermanence, life, meaning, mindfulness, thich nhat hanh. Bookmark the permalink.